The first of Australia's multiple World Cup titles. Batting first at a packed Eden Gardens, Australia posted 253, thanks to David Boon's steady 75 at the top and a breezy 45 by Mike Veletta towards the end. 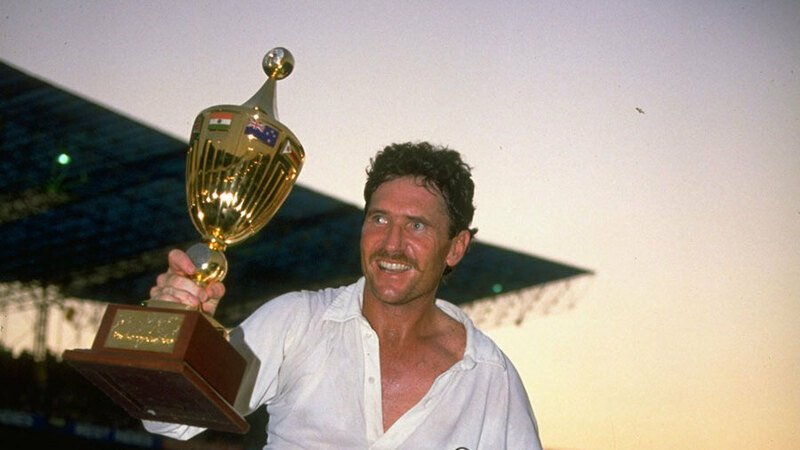 England, making their second appearance in the final, were cruising at 135 for 2 when Mike Gatting top-edged a reverse sweep off Allan Border to the wicketkeeper, Greg Dyer. Still, their target of 254 seemed within easy reach - they needed 102 off 15 overs. But after Steve Waugh took the crucial wicket of Allan Lamb (45), Australia tightened the screws. They won by seven runs and Boon was Man of the Match. Birth of Brett Lee, who excelled as an exponent of extreme speed over a decade, without achieving the all-conquering success required to earn the tag of a true Test great. Fast and with a flashy smile that added to his star quality, he finished as Australia's fourth-most successful bowler, with 310 wickets in 76 matches. He got 42 wickets in his first seven Tests but then suffered a series of injuries, first to his elbow and then several to his ankle. In 2009, having missed the Ashes because of a side strain, he decided to retire from Tests in order to prolong his limited-overs career. Three years later he retired from all international cricket. The last pair of Ridley Jacobs and Fidel Edwards negotiated the last half-hour safely to allow West Indies to hold on by the thinnest of threads in the first Test against Zimbabwe in Harare. This was the final real hurrah in Tests for a whole clutch of Zimbabwean players. Heath Streak scored a hundred from No. 8, but they were denied what would have been their eighth Test victory. After New Zealand smashed their then highest one-day total (349 for 9) to win the first match in Rajkot three days earlier, India did likewise in the second in Hyderabad. They demolished New Zealand by 174 runs thanks to an imperious batting display - they made 376 for 2, with Sachin Tendulkar and Rahul Dravid putting on 331, the highest partnership for any wicket in an ODI at the time. Dravid hit a run-a-ball 153 but was overshadowed by the majesty of Tendulkar, who faced three balls fewer for 33 runs more. All the bowlers took some fearful hammer, none more so than Chris Drum (9-0-85-0). Off the last six overs, India crashed 90. Birth of the second nightwatchman to make a Test hundred. Australia's Tony Mann followed Nasim-ul-Ghani of Pakistan with 105 against India in Perth in 1977-78. But whereas Nasim was hardly a fish out of water batting at No. 6, Mann was well and truly in at the deep end at No. 3. It was a vital innings too, as it laid the foundation for Australia's successful fourth-innings chase of 342 for 8. But Mann continued to struggle in his day job (after taking 3 for 12 in his first innings, his leggies yielded only one more wicket at a cost of 304 runs) and played only two more Tests. International cricket took a leaf out of the Sunday League's book when Zimbabwe played a one-day international against New Zealand in the middle of a Test match. The second one-dayer was sandwiched between the first and second days of the second Test, but such nonsense meant little to Martin Crowe: fresh from an imperious 140 in whites, he put on the pyjamas and cracked a match-winning 94, off only 87 balls. There was also a brief moment of controversy when Dipak Patel ran out the non-striker, Grant Flower, for backing up too far. The birth of Niall O'Brien, Ireland's feisty left-hand batsman and wicketkeeper. His most famous knock was the 72 in the 2007 World Cup, when he led Ireland to a stunning win over Pakistan. He was named Northants' Player of the Year at the end of the 2008 season and helped Ireland qualify for the 2011 World Cup - where he scored 167 runs in five matches - and the 2012 World T20 in Sri Lanka. In 2013, O'Brien played a role in helping Ireland qualify for the 2015 World Cup and two months later in winning the World Cricket League Championship. Although he retired from county cricket a year after the World Cup, Cricket Ireland still gave him a contract, especially given the team was to play its first Test in May 2018. Papua New Guinea made quite an entry into one-day cricket, needing only 39 overs to chase 203 and beat Hong Kong by four wickets in Townsville, in their inaugural ODI. Half-centuries by Charles Amini and Vani Morea revived a chase that had been flagging at 76 for 5 at one point.